The below artworks are the most important in Federal Art Project of Works Progress Admin - that both overview the major ideas of Federal Art Project of Works Progress Admin, and highlight the greatest achievements by each artist. Don't forget to visit the artist overview pages of the artists that interest you. Artwork description & Analysis: Aerial Map is one of two surviving murals that Gorky painted for Newark Airport's Administration Building. Originally ten murals comprised the cycle, entitled Aviation: Evolution of Forms under Aerodynamic Limitations. Drawing on his study of Pablo Picasso and Fernand Leger, Gorky's composition relies on bold colors and simple, superimposed shapes to convey a sense of the terrain that one would see from the air or perhaps the shape of the airport itself. The short black dashes and dots in the white shape at the center of the canvas, which roughly resembles the outline of the United States, call to mind flight routes that one would map out. 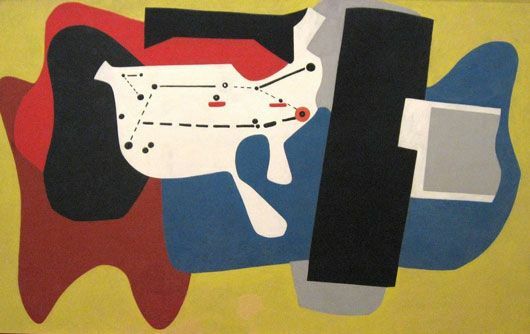 While Gorky's mural was controversial at the time because of its abstract nature, Gorky insisted that an art of the future was necessary to depict the transportation of the future. The murals were painted over when the airport was turned into a military base during World War II. They were thought lost, but in 1972 they were rediscovered, concealed under fourteen coats of paint that had been applied over the years as part of regular maintenance. Two of the panels were recovered and restored and now on view at the Newark Museum. Artwork description & Analysis: Here, Mark Rothko depicts the eerily quiet and still interior of a subway station. The space is punctuated by evenly spaced columns that recede quickly into the background. The people depicted do not interact or speak with one another. The women on the bench, with their fancy hats and pointy shoes, are completely self-involved. The man who stands near the platform edge practically melds with the column he stands near. Rothko thus captures the isolation and loneliness that can befall one in a big city. Untitled (The Subway) is probably one of the more realistic paintings Rothko created before he evolved to paint large abstract canvases with floating, sometimes translucent, rectangles stacked on top of each other. Even in this early painting, though, one can see the way in which Rothko manipulates color and space to evoke human emotions, an aim that he carried throughout his artistic career. Artwork description & Analysis: Few of Pollock's paintings that he created for the FAP survived, and those that do, like Cotton Pickers, have fairly traditional subject matter. Here, Pollock depicts the laborers, shielded from the sun in large hats and long sleeves, doing the back-breaking work of picking cotton. Pollock presents the plight of the workers in a sympathetic light. 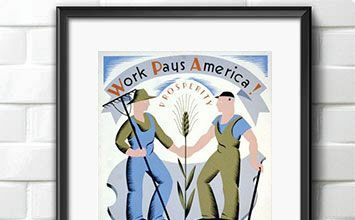 Solidarity with other impoverished workers was a staple of much WPA work. The curves of the laborer's bodies and their simplified forms call to mind the style of Pollock's mentor, Thomas Hart Benton. Benton was a proponent of Regionalism and American Scene painting, which focused less on urban scenes and more on Midwest small town and farming communities. Combining this subject matter with some of the more abstract forms of modern European art, Benton forged a uniquely American art that Pollock quickly mastered and surpassed. 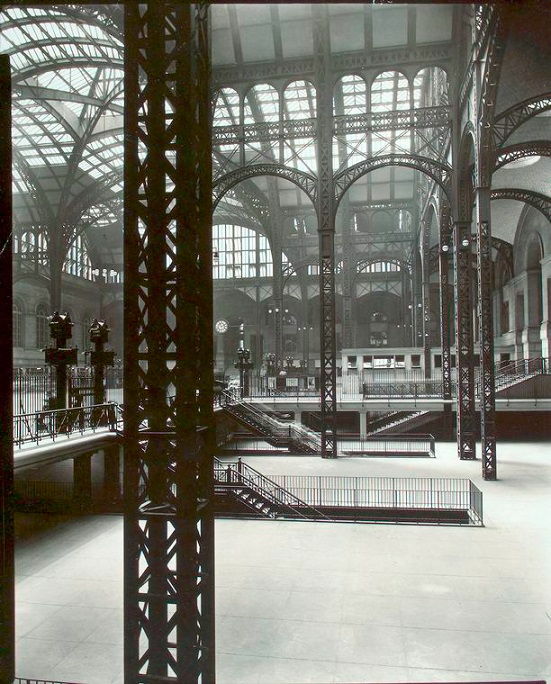 Artwork description & Analysis: In this image, the renowned photographer Berenice Abbott captures the soaring structure of the original Pennsylvania train station in the heart of New York City. Steel girders rise high into the air, supporting massive arches, and the interior is sunlit with countless windows held in place by the steel structure. With this composition, Abbott celebrates the grandeur of technology, transportation, and ultimately New York City. Abbott arrived in New York City in 1929 and immediately began taking photographs of her new environment. It was only in 1935 that she was able to get funding from the FAP for her series. She was made the supervisor of her own project, "Changing New York," and was assigned assistants. With the series, she aimed to document the diverse city population, their public and private environments, and their daily activities. She hoped that people would be able to visualize their daily lives and realize that their collective behavior contributed to their environment and vice versa. Abbott combined what was basically a sociological study with modernist photographic aesthetics, using sharp angles and eschewing traditionally "pretty" compositions to create an image of a city on the edge of transformation. Artwork description & Analysis: In this mural, Shahn depicts the journey and struggles of the Jewish immigrants from Germany and Eastern Europe to America. Using a montage composition, Shahn shows on the far left German soldiers and Ellis Island, signaling the arrival of the Jewish immigrants, including Albert Einstein and Shahn's own mother, and on the right, their entry into factory sweatshops and tenements. The second panel depicts their involvement in the trade union movement, with the infamous Triangle Shirtwaist Factory, the scene of a horrific fire in 1911 that killed almost 150 garment workers, in the background. The third panel shows the evolution of the labor movement to the planning and development of Jersey Homestead (now Roosevelt, NJ), a cooperative of factories and farms. Influenced by the Mexican muralist Diego Rivera, Shahn employed a Social Realist style to depict the struggles of industrial laborers and promote class and community consciousness. The juxtaposition of images and various perspectives give a sense of the complexity of the industrialized system and the myriad of people who live in urban centers. The facial expressions and gestures of the individuals Shahn depicts suggest the acute need for activism. Shahn hoped that his art would inspire the laborers who saw his depictions of their plight to fight for the workplace reforms that were desperately needed. Artwork description & Analysis: In this large-scale painting Alston depicts traditional healing practices from Africa, where, traditionally, illness was thought to be an indication of spiritual imbalance. The panel is paired with his other mural Modern Medicine, a panel which depicts new technology and both White and Black doctors. The diptych suggests the place of both spirituality, or faith, and reason and science. At the top of the mural, the landscape and flora and fauna of Africa dominate the composition. Alston included a representation of a Fang reliquary sculpture from the central African country of Gabon. Such sculptures were collected by his contemporaries, and the simplified forms and shapes of such sculpture influenced countless modern European and American artists. Other ritual objects such as drums and statuary can be found throughout the composition. The robed female figure in the bottom right corner of the canvas represents a spiritualist and healer distributing herbal medicines and traditional cures. Alston's use of sepia tones gives the whole composition a feeling of bygone eras. In 1936, Alston became the first African-American artist given a supervisory role on the FAP. 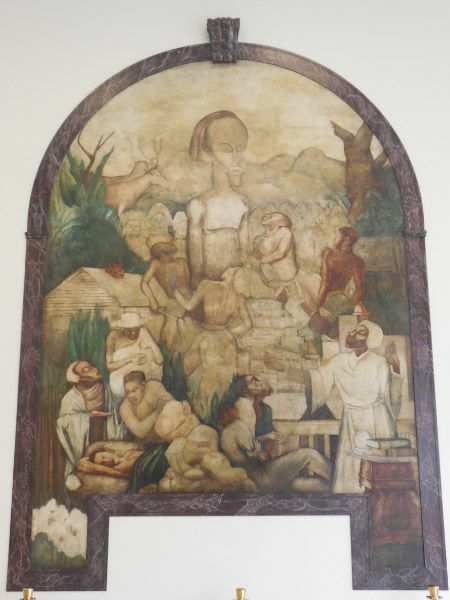 He oversaw these and other murals at the Harlem Hospital. His own murals, though, were deemed controversial in their prominent display of African and African American subject matter, despite the fact that FAP encouraged community-centered subjects. After much protest, including a letter to President Roosevelt, Alston was allowed to install his murals in 1940.